Last night since I had a rather large herb bouquet leftover from the market this weekend, I decided to fool around with some of phyllo dough, called brick in France, and herbs. I have enveloped goat cheese and sprigs of thyme before with success, and an idea came from a recipe in Régal, which uses a technique to make a quasi mille feuille using layers of this type of dough which has sprigs of dill appliquéd between two circles of the dough with clarified butter. The home cook is instructed to fastiduously cut the dough into 36 perfect circles. I skipped that, not being the perfect circle type. But I did like the pretty effect of applying the herb to dough. First thing: Pure butter is just too greasy. I started cutting it down with some dry white wine, making an emulsion of wine and butter, testing each time in the oven. I found that about a 1:3 butter wine ratio did quite nicely and I still think that I could have cut way down on the butter. I finally ended up with some crispy light bread sticks by taking a rectangular sheet of dough, spreading a thin layer of the wine and butter mixture over 1/2 of it, lining up the edge of the sticky side with herbs up the edge, sprinkling the sticky side with sea salt, folding the dry half over and smoothing it, and then rolling the whole thing loosely into a cigar shape. These go together very quickly. I popped them into a hot oven, herb side down for about 3 minutes, and then flipped them over and baked for another 3 minutes. They were crispy all the way through and entertaining to eat, and since they had different kinds of herbs: dill, chervil, soft spring thyme shoots, and chives, they tasted different with every crunch. I can imagine heaping a whole bunch into a big basket for a party. 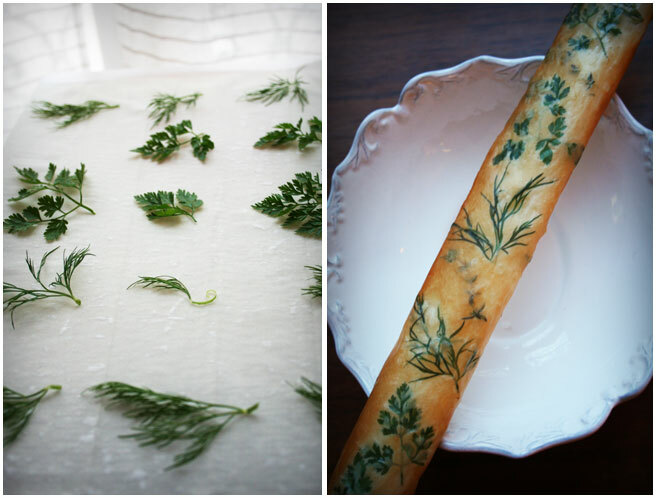 Another idea would be apply herbs under a transparent filo feuille to bread dough before baking. Rolls, a loaf of bread, or maybe even some kind of savory cake might be nice with this type of applied decoration. I'll try something like that very soon. Hurray - you enabled comments! So I can say how beautiful I think your little place is here, and these breadsticks in particular are just lovely. I have a roll of phyllo dough in the fridge, and some exploding herb plants outside the back door, and I totally want to try it. Marvelous idea. I look forward to your posts - very beautiful. Your foto is very beatiful! And this Breadsticks so delicious! Your fotos are very beautiful! i remember i visited ur blog 2 years ago through another link and mainly for the bread sticks,i love those bread sticks.sooo beautiful. dont know if u read ur comments for old posts, but i remember i had asked if we could make this without wine, coz i dont take alcohol. any other way to keep these dry and not too oily ,without using the wine?Thanks for any suggestions!!! Hello- about the wine... Why not try vegetable bouillon or even water? Try it out and see if it works! I added some chevre and cracked pepper to these and made them for a wedding reception. They were so popular that I was asked to write the recipe in the guest book so that everyone could share it. Thanks! What a fabulous idea. I can hardly wait to try it. A different flavour with every bite and they are so beautiful. I recently made some pasta using this technique of incorporating herbs into the pasta dough; the herbs come out like a japanese silkscreen painting; love these and will try them.